For more information or a personalised quote, just give us a call. 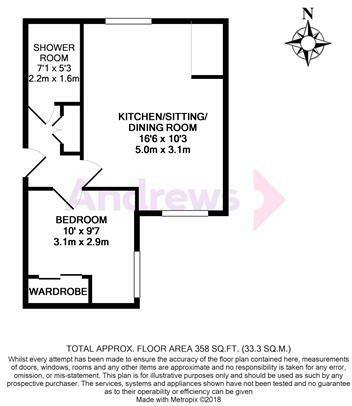 Alternatively, if you are under 60 or would like to purchase this property without a Home for Life Plan at its full market price of £115,000, please contact Andrews. Situated on the second floor of this complex of retirement apartments and at the rear looking over the communal gardens. You enter the flat through a private front door into the entrance hall. Straight ahead you will find the open plan kitchen, dining and sitting area. The kitchen is in an excellent condition with a modern style range of units. The sitting room is a light and airy space with views out onto the peaceful communal gardens at the rear. To the right is the double bedroom which has a built in wardrobe for storage space and opposite is the shower room, consisting of a walk in shower with a seat as well as a vanity unit and WC. 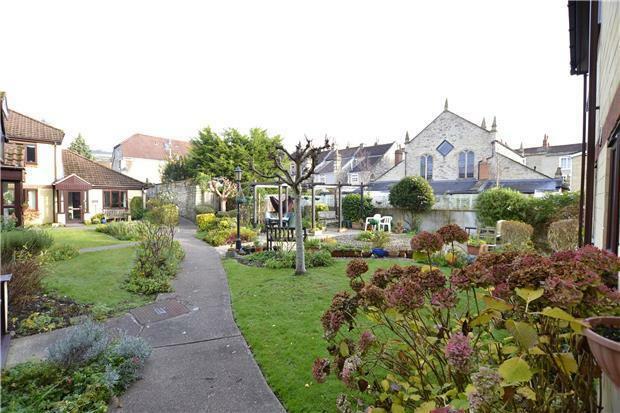 Sheppards Gardens was completed in 1986 and caters for residents over the age of 55s. There are excellent communal facilities to include unallocated parking, gardens, laundry room, lift and communal room. The development is warden assisted and there is an alarm system within the flat for 24 hour assistance. The communal facilities include a twin bedded guest room for visiting relatives, residents lounge, communal laundry with automatic washing machine and tumble dryer and maintained communal gardens. Offered for sale with full and vacant possession. Storage cupboard, warden aided alarm panel, loft access. Double glazed window to rear, single glazed internal window to hall, part tiling to walls, single drainer, single bowl inset sink unit with cupboards under, base and wall units, laminate worktops, plumbed for washing machine, electric storage heater, television point, telephone point, emergency pull cord. Low level WC, vanity hand basin, shower cubicle, part tiling to walls, electric heater, extractor fan, emergency pull cord. Double glazed window to side, range of fitted wardrobes, electric storage heater, emergency pull cord. Disclaimer - Property reference 4541_378363. The information displayed about this property comprises a property advertisement. Rightmove.co.uk makes no warranty as to the accuracy or completeness of the advertisement or any linked or associated information, and Rightmove has no control over the content. This property advertisement does not constitute property particulars. The information is provided and maintained by Homewise, Covering Bristol. Please contact the selling agent or developer directly to obtain any information which may be available under the terms of The Energy Performance of Buildings (Certificates and Inspections) (England and Wales) Regulations 2007 or the Home Report if in relation to a residential property in Scotland.